There would have been more than three geckos but my concentration levels are a bit poor at the moment and so a few rejected ones are lying beside me, with their legs in the wrong place! 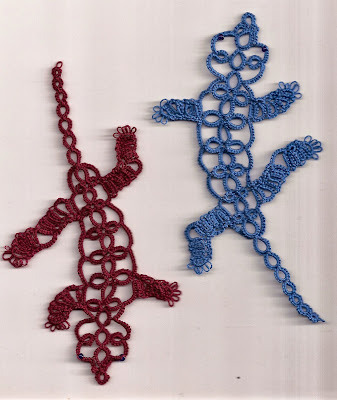 The pattern is of course from Jane's site and it is called Pamela's Gecko and can be found here I have actually seen Pamela's Geckos in real life! However, the main reason for taking a break from daisies to tat these little fellows is because of someone I was talking to in the village where I live. I have known this person for many years but what I did not know was that she had a son who also lives in Singapore, her daughter-in-law makes pottery and has named it Gecko Pottery. 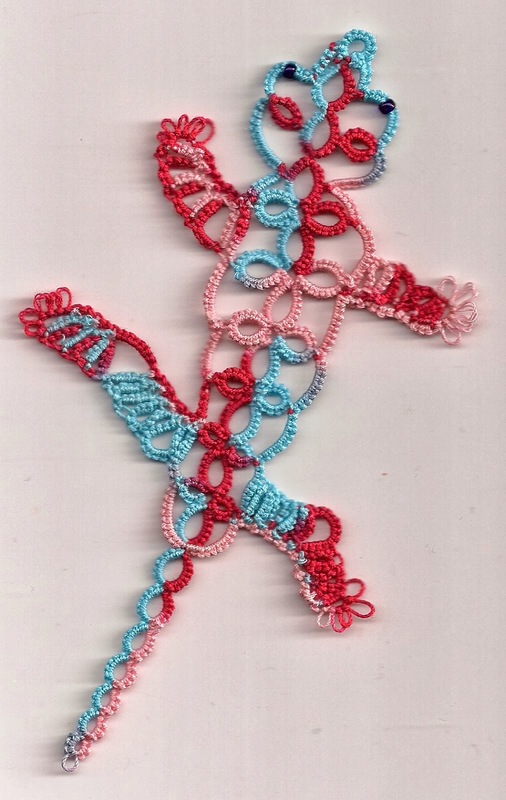 So that is why I decided to make a gecko so that it could travel to Singapore. But first I made one from variegated thread because they look so much fun in the different colours. Having lived and visited many places in the Far East, the last time being June, I am quite used to seeing geckos. When my son came back from one of his trips to Asia a gecko must have wanted to return with him. A dead one was found when sorting out the luggage recently, obviously it must have crept in there at some point during the holiday so you can imagine the horror at its discovery! I am really looking forward to going back to the daisy pattern and hope to get it written out and posted on the blog soon. we used to call them chee-chas when I was a child in KL after the war. I love your bubblegum version! They are beginning to emerge from winter hibernation here at this time of the year, and I like having them in the house - they eat cockroaches and mosquitos! I lost my comment, hope you don't get it twice. I love your geckos, especially the multicoloured one. We have geckos here too. I made 6 of Jane's (Pamela's) geckos and I know that not all the legs were perfect. Your geckos are just adorable. Sorry about the poor little passenger. The real ones are so cut.